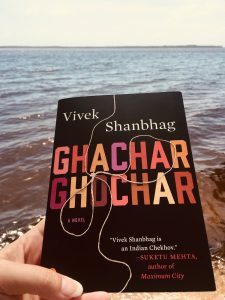 I won a copy of Vivek Shanbhag‘s Ghachar Ghochar through Goodreads. A young man’s close-knit family is nearly destitute when his uncle founds a successful spice company, changing their fortunes overnight. As they move from a cramped, ant-infested shack to a larger house on the other side of Bangalore, and try to adjust to a new way of life, allegiances realign; marriages are arranged and begin to falter; and conflict brews ominously in the background. Things become “ghachar ghochar” – a nonsense phrase uttered by one of the characters that comes to mean something tangled beyond repair, a knot that can’t be untied. Interesting, I think that’s the right way to explain my thoughts on this book. It’s an interesting look into the lives of a somewhat dysfunctional family. But it also leaves you wondering and speculating at the end. What really happened? Did anything really happen. If it did, who is responsible and who actually knows. Ghachar Ghochar is a quick read, but packs a lot of punch in it’s pages. Well worth picking up. This entry was posted in books/book review and tagged book review, India, literary fiction, won on December 29, 2017 by Sadie.